As soon as I heard about Run yourself Fit, I thought of you. I get asked so many questions about how to start running from scratch and I know there are stacks of you who are secret wannabe runners. Maybe you have never tried running but fancy having a go. Perhaps you tried it once, found it too hard and gave up (been there, done that). Or maybe you used to run but haven’t done it in years. If any of these sound like you, this book is definitely for you. It’s written by Editor-at-Large of Women’s Running magazine and all-round running nut Christina Macdonald, and what she doesn’t know about running isn’t worth knowing. The book covers the practicalities of what you need to get started, how to get yourself in the right frame of mine to get off the sofa, and literally what you should do the very first time you haul yourself outside and take your first steps. Christina suggests a weekly timetable to get you started and advises on how to build up your fitness, how to deal with injuries and what to eat for health, weight loss and racing. The tone is friendly and straightforward without being at all patronising. It’s the next best thing to having your very own personal trainer. I’ve put a Q&A with Christina up on my Facebook page. You’ll find it HERE (and if you fancy giving my page a like, I wouldn’t mind a bit! Please, please let me know how you get on with your first attempts at running – can’t wait to hear from you! 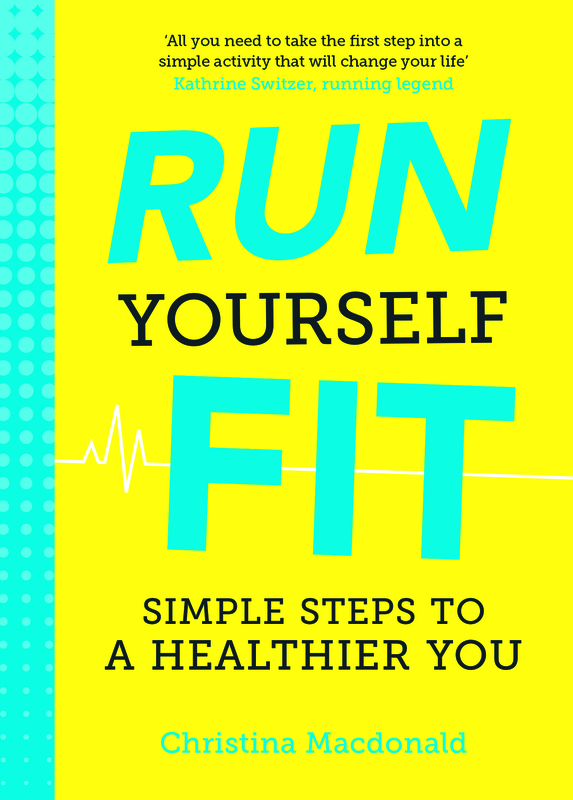 Run Yourself Fit is available for £6.99 from Amazon. I hate that despite trying many times, I can't seem to get into running to the point where I enjoy it. I'm currently giving it another go but the famous 'runner's high' always seems to elude me. I totally get that. I find that (a) running in the prettiest places I can find, (b) choosing a run with a nice, big downhill bit and (c) not going too fast all helps! I love the fresh air it gives me. I live on the North East coast right beside the beach. We have a long prom and pier which are great to run along but it is always so cold during the Winter months and busy during the Summer months! Oh, how lovely to run next to the sea, though. Must be bracing on a windy day! It's a great feeling, isn't it?! I love running outdoors because it always feels peaceful and quiet... but running on a treadmill is my idea of torture! That's exactly how I feel about rowing! Love, love, love rowing on the river. On the rowing machine, though, pretty much sheer hell!! I don't know how people can run in bad weather :- e.g.rain etc. I was a walker in the past. Never have liked the idea of running in the rain, also surely difficult, as muscles relax better with some warm. My main problem when running is that one of my ears block and I can hear myself 'inside my head' which is very annoying. I wonder if that is a problem for anyone else too? That's really interesting. I've never heard of that problem before, but I bet you're not alone in it. Have you asked on running forums? Yes, they do say that the hardest bit is getting out of the door in the first place. The thing I love most about running is the feeling afterwards, I always feel more relaxed and like I have accomplished something. I love discovering new places whilst running, but I hate when I get bored on a long training run! I love the idea of exploring a new place this way. Maybe I'll try that next time I travel! Getting hot and sweaty and in my case looking like a beetroot! The beetroot look is totally in - shows you worked hard! I love it when I'm on the go - it's the getting motivate to get out of bed and off for a run that I hate. There's some good advice in the book about mixing it up! Hope you can find a way to put some variety in. Really enjoyed your post - thanks for linking. Especially like, "You don’t get a PB by comparing your race time to someone else’s, you get a PB by improving yourself." So true. I need to remember that in rowing. I don't like that it can ruin your knees if you do a lot of it. There's advice on preserving your joints in the book - worth a look. I hate the idea of bumping into someone I know and having to talk to them whilst looking a sweaty mess! They're probably just dead impressed that you're out running! I worry that I'll only be able to run for 5 mins and then be totally out of puff and just look ridiculous! I think everybody feels like that at the beginning. There's some great advice in the book on how to build up gradually (mixing running with walking), and Christina does say the most common mistake people make is to go off too hard and then run out of puff! I love running on unknown routes so I don't know how far I am from the end! Ooh, nice idea. It's a long time since I've done that. That seems to be a common issue! I like running but hate the impact it has on my knees. Yes, this seems to be a common concern. The book does cover joint issues. I love running early morning in the winter / autumn months. Something about running in the dark / colder periods just appeals to me. I live on a farm with no street lights for miles, so I hate running in the dark. I wish they would stop putting the clocks back. Oh, that does make things difficult. I suppose summer running in a beautiful place makes up for it a bit, though. I can totally relate to that! Ooh, I've never run in the snow - it must be amazing. I love running through beautiful countryside. It's so easy to lose yourself! Yes, nothing like some lovely countryside to take your mind off the running! It's a great feeling afterwards, isn't it? I love raising my heart rate from running. Just wish I could run for longer! I hate that I'm so unfit I can't even run a short distance. Really want to be able to run around with the kids and not have to stop coz I am so out of breathe. It's great to have a motivation like your kids to get yourself fit. Good luck with your efforts! I would love to be able to run but have never found the secret. My throat closes up and I can't breath. I can only do about 10 running steps at the moment but I am determined to get fit and overcome this. This book sounds like the answer, thanks. I can really relate to this - the first time I tried running I went at it too hard and thought I was going to die! The book has brilliant advice about pacing yourself and building up gradually. I'm still waiting for that amazing moment! Ha, I think we can all relate to that! Have you tried going a bit more gently and building up from there? I'm trying to love it , but I'm still so unfit I need lots of help. But one thing I like about it it feels like I'm running from problems. It is hard at the beginning as your body gets used to the exertion. Christina has great advice about building up your fitness in a manageable way. I love running, parkruns, races, exploring new places, feeling happy and strong at the end of a run...the list goes on! Fab! I have done one parkrun and it was great. I can relate to this! Dancing is great for your fitness, though, so if you enjoy that more, maybe you should stick with what you love. Just a thought! That's a great way to start. YOu'll be surprised by how quickly your stamina improves. I love the fresh air and time to think and clear my mind! Yes, it's a great feeling, isn't it? I am very lucky in that I live in a very pretty place and always have lovely scenic places to run. I love the way running makes me feel, it gives me a sense of freedom, exhiliration and peace. The only thing I hate about running is going out in the cold weather! It helps a lot having beautiful surroundings. And it's SPRING TIME soon!!! Took up running when I was 25 Im now 55 and have only had a break to have 3 children. I love running its easy to put on your shoes and go. You dont need special clothes just good trainers. You can add some walking and hills and it costs nothing. Swimming and gym costs mega bucks takes time to get there before anything is achieved. I can run get home and shower before gym people even start training. Yes, that's a huge benefit, isn't it? You can pack a huge amount of exercise into just half an hour! That's one of the brilliant things about sport, isn't it? I prefer running without music, but I know lots of people swear by it. I hate pressure on my knee. I used to do a lot of running before I had my kids - even did the London marathon back in 2009 - I used to love the time to myself to listen to podcasts. Wow, that is impressive. Hope you can get back to it before too long. I hate running in public! I think a lot of people feel that way! I love getting out and exploring and running is a great way to do it whilst keeping fit!